Leatherette sewn table tents are offered in six binding colors. 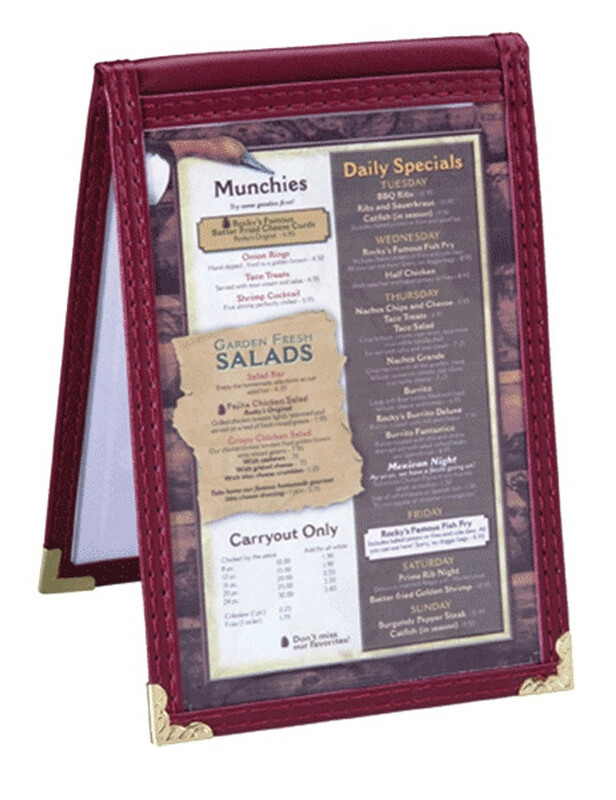 Leatherette sewn table tents offer great style and function at an excellent price. Matches our leatherette sewn menu covers for a completely unified look. Choose from six binding colors, gold or silver decorative corners and gloss or matte 10 gauge clear vinyl. Edges are turned in and stitched with coordinating thread for added durability. Custom sizes and configurations are also available. Minimum order 12 table tents. Leatherette Sewn Two View Table Tent 4" x 6"
Leatherette Sewn Two View Table Tent 4" x 8"
Leatherette Sewn Two View Table Tent 5" x 7"